Where were we – oh yes, in the Buonivini Vineyard. Now onto Syracuse, site of an ancient city, the most powerful Greek city, west of mainland Greece. Greek Dionysus 1 the tyrant, made Siracuse into the powerhouse it became. Now, the ancient site is an archeological park. Think I expected the walk around a park full of jostling tourists (like me! ), and find it a bit of a robotic experience. Quite the opposite in fact. 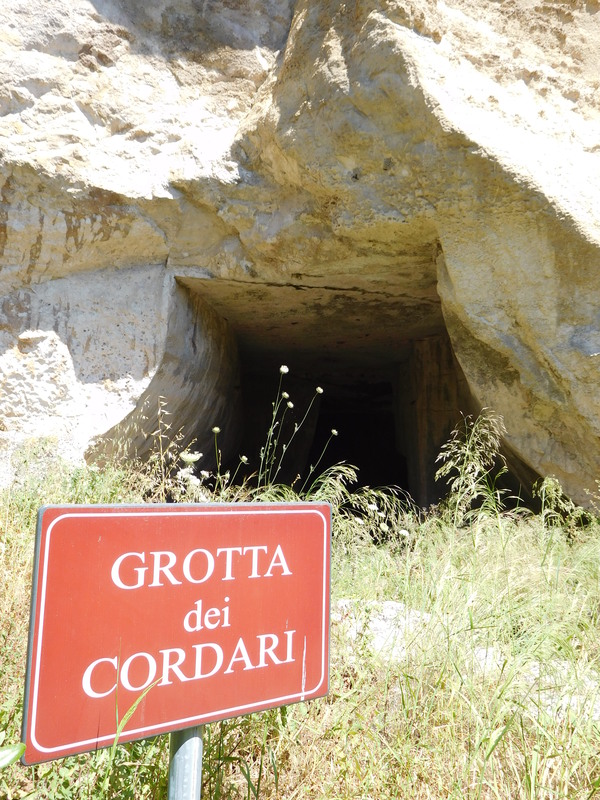 The story connected to the ‘Ear of the King’ cave is : King Dionysus was an absolute ruler who co-opted both poor and rich people to be his slaves, for life. He was paranoid and thought they were all complaining about him. No doubt they were ! So he had a hole drilled through the rock between his area and the slaves so that he could eavesdrop on their resentments. We walk through the caves, emerging into the bright sunlight, and breathe in the scent of aromatic shrubs, it feels mesmerising. Also I learn a little about the history. The contemporary crowds are absorbed into this ancient space, I feel I am in my own trance. 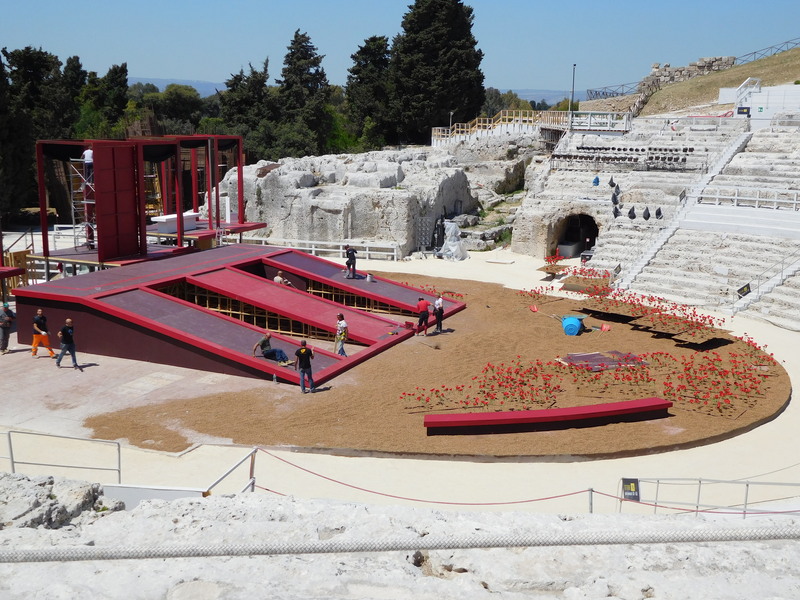 I really like the fact that there are modern stage hands preparing for a production in the monumental Greek theatre. I like that the modern set is red, so vivid against the bleached old stone seats. Onto Ortygia, an island joined by a bridge to the mainland. Time to eat an arancina- an ‘orange’ shaped croquette, filled with savoury rice and ham. Favourite food of Salvo Montelbano ! No time, no time to explore to explore the alleys – it’s time for a boat trip around the island. The sailor is also a fisherman, handsome and charming, adept at steering into caves. The boat unsettles birds nesting inside the caves. 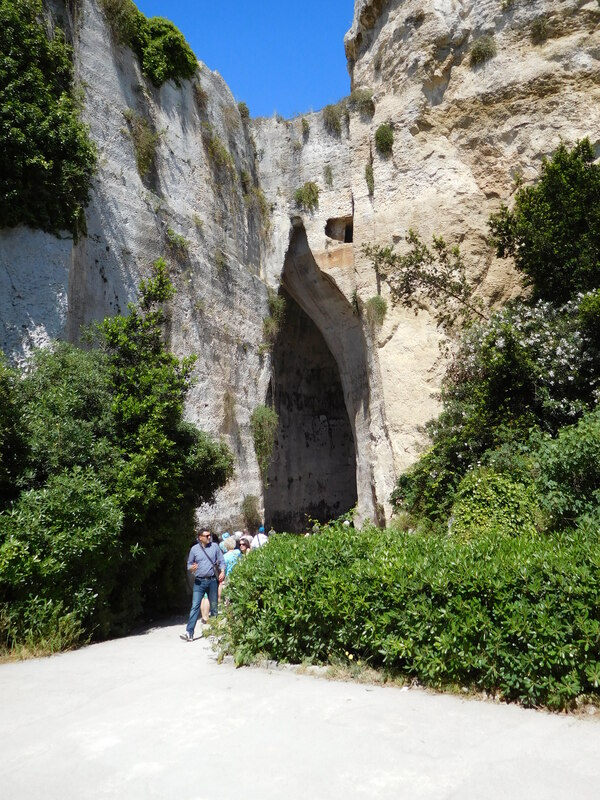 Inside the cave, you can see subtle veining of blue rock within the dark, damp walls. 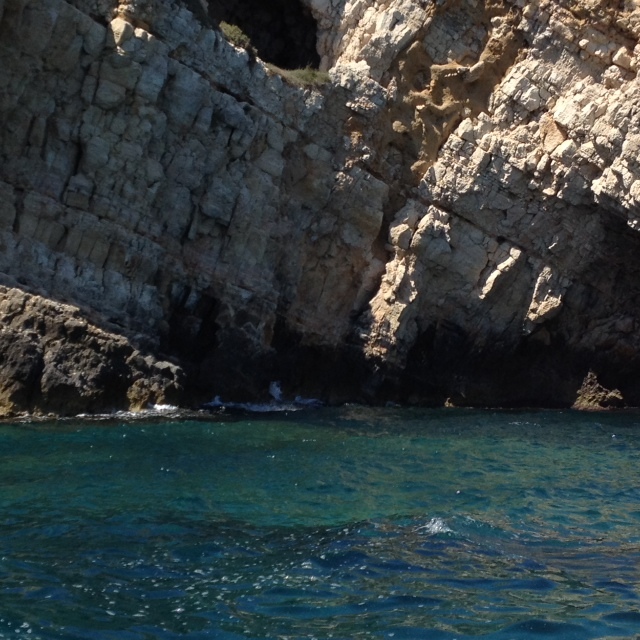 The sailor says: this cave has Odysseus’ ghost in it….I can imagine that. Maybe he got fed up with his odyssey, and wanted to retreat to a quiet cave? And finally, as fits a trip to Montelbano’s Sicily, we visit ‘his house’ in Punta Secca, on the sea shore, where he is shown striding from the sea after his regular morning swim. Punta Secca is a quiet, small and beautiful seaside town. 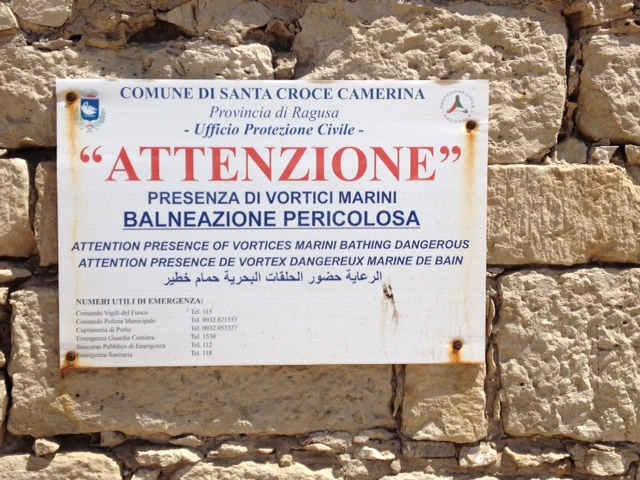 In reality, the sea in front of ‘his house’ has perilous currents and a warning not to swim there. So he must actually swim in the sheltered bay around the corner. It is fiction after all ! 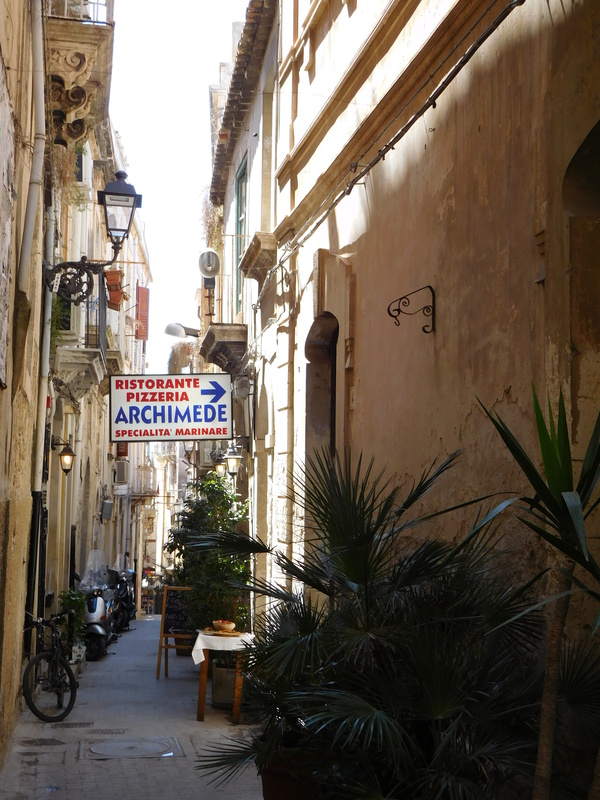 I am so glad to be here – hope you have gained a sense of Sicily’s beauty and extraordinary history. Wow Sue – you have really travelled. I think Scotland feels different to England – a different culture. A friend of mine worked in New Zealand for several years, and said she found the culture and the landscape wonderful. Do hope you get to go. I find it so much easier to be in the moment when I am traveling. I’m free of everyday responsibilities, don’t have chores to do, and I can focus my attention on wherever I am. And since it’s all novel and interesting, it’s easy to stay with what I’m doing. I would love to learn to bring that kind of presence to my regular life as well. You are so right. 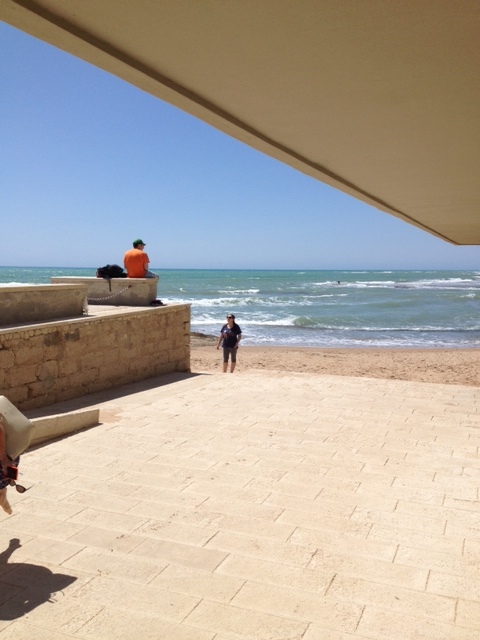 Think I did manage to ‘live in the moment’ when I was in Sicily. Now back home, I want to return to Sicily ! I know its not real life…. Sounds like a wonderful trip that went by too quickly. You’re right- looking back from now – my Sicily trip feels like a golden dream ! Where do you like to travel to ? I love Maui, but I’ve been there only once. I visited Great Britain once, and felt an earth-deep rooted affinity for Scotland. Closer to home, I love going to Disneyland. 😉 I’ve been from coast to coast in the US, lived in three different states, four different cities, but it seems to me there is so much more cultural variety in Europe than there is here. And I am at a disadvantage speaking only one language fluently. I would dearly love to see New Zealand and Australia, Wales and Ireland.